Alexander Gray Associates presented a selection of paintings and works on paper by Betty Parsons and Joan Semmel produced while they were working in Southold and Springs, NY, respectively. Two highly influential figures in the New York art world, Parsons and Semmel’s radically different practices are united by their shared affinity for the East End and the indelible mark it left on their approaches to art making. Placing the work of Parsons and Semmel in dialogue, the presentation juxtaposed and established connections between their distinct ways of working. While Parsons’ abstract and improvisational methods were informed by the ephemeral—in her words, “the invisible presence” of life—Semmel has portrayed the corporeal in an effort to question the objectification of women’s bodies. Despite these differences, the restive seaside environs of the East End encouraged both artists to experiment with new mediums and compositional devices. For Parsons, her weekends in Southold led her to refine her unique brand of painterly abstraction. Meanwhile, summers in Springs prompted Semmel to retool her self-portraiture, depicting her body—as well as the bodies of others—in a public, rather than private, realm. Long celebrated for her perspicacious work as a gallerist and the pivotal role she played as a champion of Abstract Expressionism, Parsons was first and foremost a dedicated painter and sculptor. Committed to abstraction, she was intent on capturing what she called “the new spirit” and “sheer energy” of life. From the late 1950s until her death in 1982, she commuted from her New York City apartment to her studio in Southold, NY each weekend. Designed by the sculptor Tony Smith and completed in 1960, this structure perched above the beach and framed expansive views of the Long Island Sound. Inspired by this vista, Parsons sought to combine the formalism of modernism with allusions to her surroundings, in the languages of both geometric and gestural abstraction. In a period of experimenting with sculpture in the late 1960s, Parsons began to decorate stones she collected from the Long Island Sound with bold patterns. With the encouragement of the painter Jack Youngerman, she translated these designs onto canvas, producing abstract works like Horton’s Point (1968) that married the graphic flatness of Pop and Op art with references to the natural world. 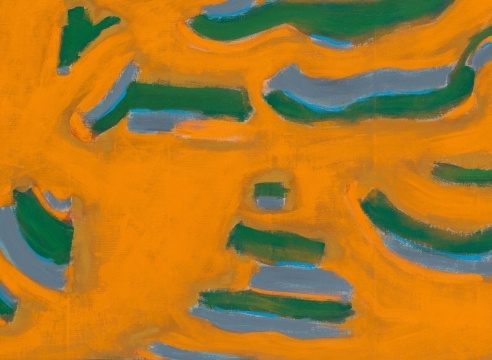 In her gestural paintings from the early 1970s, including By the Sea and Rock Rhythms (both 1970), Parsons featured bold colors and scattered abstract forms that suggest the coastal landscape and atmospheric effects of Long Island. Like Parsons before her, Joan Semmel divides her time between the city and the East End. Since 1971, she has spent summers in East Hampton, NY, ultimately purchasing a home in Springs in 1987. In Springs, she painted her Beach Series (1985—87). Featuring images of men and women reclining on the sand, she created this series from photographs she took while at the beach. Unlike her earlier works, which isolate figures against expressive grounds of color, in these paintings, she positions bodies in a distinct East End landscape. In a thematic departure from her early 1970s self-nudes, Semmel’s Beach Series communicates the psychological experience of feeling lost in a crowd—alone and isolated even on a crowded beach. Combining realism with a more gestural, expressionist approach, these compositions build on her previous self-portraits. With Weathered (2018), Semmel brings the subject of the coast into her most recent work. In palette and composition, it reflects the landscape, with limbs overlaid like hills and beaches against the pastel blue background of the sea. Painted from the artist’s perspective, the paintings continue her decades-long project of reclaiming female autonomy through the portrayal of her body in contexts that challenge cultural and societal norms of female representation. Parsons’ and Semmel’s work has garnered renewed attention in recent years. Their practices are increasingly relevant in a contemporary art landscape shaped by feminist movements like Time’s Up and #MeToo. Paintings and sculptures by Parsons were recently the subject of a solo exhibition at Art Omi, Ghent, NY and her work is currently included in She Persists: A Century of Women Artists in New York at Gracie Mansion, NY. Semmel is currently featured in the group exhibitions A Woman Looking at Men Looking at Women, Muzeum Susch, Switzerland, and Half the Picture: A Feminist Look at the Collection, Brooklyn Museum, NY. A traveling retrospective of Semmel's work is planned for 2021.